Hopefully yours, Connie: You're Infertile and Your Friend is Pregnant -- How to Cope? You're Infertile and Your Friend is Pregnant -- How to Cope? 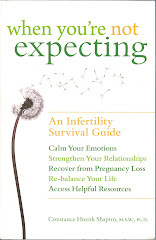 The emotional challenges of infertility increase whenever your support network feels shaky. And, for many of us, either because we have been cautious about sharing news of our infertility, or because our network is fairly small to begin with, the news of a close friend's pregnancy can feel like an especially damaging lightening bolt. It may reverberate through your network, causing everyone to wonder how you're "handling it." It pushes your own buttons about how you can continue to be a good friend as you are aware of your own jealousy and envy. And it stimulates so many questions about your ongoing relationship (Can we remain friends? Can I count on her sensitivity? Will other friends forget about me and my feelings as they celebrate her pregnancy? Will I cringe as I look at her swelling abdomen? Will she be willing to talk with me about how our friendship can coexist with her motherhood?). This "friend" may actually be your sister or your cousin -- in other words, you go "way back," share many memories, have ongoing ties with other family members, and probably have some experience in ironing out rough spots that have developed in your relationship. But, for now, the uniqueness of this relationship is that she is plunk in the middle of your family. So it feels as if this pregnancy will echo and reverberate around the family system, with other relatives wondering how they can be sensitive to you and attentive to her news. Just keep in mind that if you and she can talk about this between yourselves and vow to be as emotionally open and clear as possible, other family members will take their cues from both of you. This friend may be someone in your infertility network who, like you, has struggled with her reproductive health. If so, she will be apprehensive for months about whether this pregnancy is a healthy one, and her own anxieties about this may interfere with her capacity to focus on your ongoing infertility concerns. So your relationship with her will be complex: at the very time she may appear as a beacon of hope that pregnancy can happen to someone with infertility, she also will have her own worries about burdening you with her pregnancy concerns. So, the bottom line is that you and she will need to be as aware as possible, both of one another's needs, and of your own needs as you determine how or whether to lean on each other. It is possible that each of you will decide that certain topics are still good to share, whereas the strong shoulders of other friends are more suited for other topics. And, as her pregnancy continues, you will constantly need to revisit your relationship and how you can remain emotionally responsive to each other. Should she experience a pregnancy loss or some unexpected pregnancy complications, you both will learn still more about how resilient your relationship can (or cannot) become. And then your friend may be "just" a friend. But friends come in many shapes and sizes, so you'll need to think about your shared history, how you have worked through past difficulties, her empathy as you've struggled and coped with infertility, and whether she has plenty of other friends with whom she can discuss her pregnancy and plans for motherhood. And, just as you will do with a sister, a cousin or a member of your infertility network, it will be easier to move forward in your relationship if you and she can be clear as possible about how to keep your communication open. Although I began this blog with the assumption that your friend is pregnant, we should keep in mind that an impending adoption can bring about many of the same responses between you and your friend. If she is adopting, she may share your experience with infertility. Or she may be a single "mom-to-be" by choice. Or she may be a lesbian. Or she may have chosen adoption as a way to expand her family for a wide range of reasons. However, she is progressing along this adoption pathway with high hopes for motherhood, and it will be challenging for her to contain her excitement as she anticipates the arrival of her child. So you and she, as with any other pregnant friend, will need to be as open as possible about how to move forward in your friendship. How do you feel about hearing about the details of her pregnancy? How does she feel if you would prefer she keep these details to herself? Does she have other friends with whom she can have these pregnancy discussions? Is it difficult for you to be with her as her abdomen swells, as she wears maternity clothes, and as she looks increasingly pregnant? Can e-mails and phone conversations substitute for in-person lunches, coffees and walks in the woods? Will it be painful for you to be included in/invited to her baby shower? If so, will she understand and be willing to help other friends and family members to be sensitive about your absence? Is it likely you will be asked to be her baby's godmother? If so, you need to think this through carefully. To accept this new role will cause you to have feelings of obligation and responsibility that will guide your connections with this baby for many years. If there is a christening, a baptism or a bris, will it be painful for you to attend? Will she be supportive of your decision and help other friends and family to support you in this choice? After the baby is born, what sort of contact will be most comfortable for you? This may not be something you can know in advance, but you and your friend should keep all options open, which can include baby-less lunches/coffees/healthy walks as opportunities to spend time with your friend. At any time during her pregnancy and early motherhood, both of you will want to check in with each other about whether there are things you need to revisit in your evolving relationship. Remember that this is a two way street and each of you wants to understand how to be as thoughtful as possible about the issues that arise, many of which will be unexpected (think of your baby-less times being interrupted by mutual friends descending to ask your friend about the baby, as they compare notes on their own pregnancies and new motherhood experiences. Those of you who have read the chapter entitled "The Club" in my book When You're Not Expecting, will understand this example all too well). Another decision you may find yourself making, either during your friend's pregnancy or during her months of new motherhood, could have to do with expanding your own friendship network. It isn't to say that your friend will be less available to you (which certainly is very possible), but to emphasize the creativity you can use at this time. Not only may you need more friends without pregnancies or young children, but you also may want to find friends who can distract you from the challenges of your infertility. So, with that in mind, consider befriending individuals/couples who happily think of their lives as child-free, individuals/couples who are empty nesters, and individuals/couples who share interests or hobbies you would like to develop more fully. A friend's pregnancy may arrive like a bolt from the blue, but once you've caught your breath you can use this new event as an opportunity to think more purposefully about what you need and can offer in a friendship. Remember to keep the emphasis on mutuality, on open communication and also on expanding your friendship network in new ways. Infertile? Feeling Left out of "The Club?"